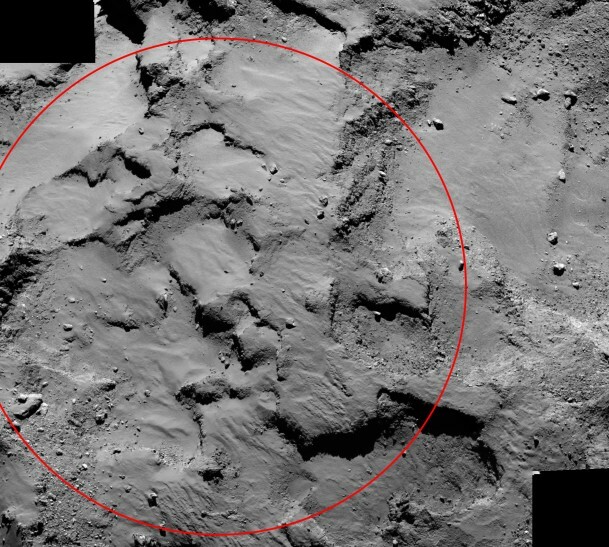 A mosaic from the European Space Agency’s Rosetta spacecraft shows “Site J,” the primary landing site on comet 67P/Churyumov–Gerasimenko for the mission’s Philae lander. Rosetta is the first mission to attempt a soft landing on a comet. The mosaic comprises two images taken by Rosetta’s OSIRIS narrow-angle camera on Sept. 14, 2014, from a distance of about 19 miles (30 kilometers). The image scale is 1.6 feet (0.5 meters) per pixel. The red ellipse is centered on the landing site and is approximately 1,600 feet (500 meters) in diameter. Site J is located on the smaller of the comet’s two lobes. On Nov. 12, the Rosetta spacecraft will release Philae at 01:03 a.m. PST/10:03 CET/09:03 UTC (the time the signal is received on Earth). Touchdown of Philae on Site J is expected about seven hours later, at around 8 a.m. PST/17:00 CET/16:00 UTC (Earth Received Time).